Popular Science Blog - Luxury Travel = In-Flight Smoking? It will never fly. You'll never get 400+ smokers paying over $2500 a ticket so they can smoke on a flight. This is either a major scam or some brainless people have no business sense. i think this is another one of them stupid american scams , the plane will explode and have tons of problems , they will make no money period. smoking cancer sticks isn't a luxury , unless u plan on getting buried anytime soon in a fancy casket. It's definitely not a stupid American scam. It's an Eastern block scam. Did you get a load of the funny grammar? Oh come on! pple used to smoke on airlines all the time. Wad makes you think there would be explosions? We arnt using hydrogen to lift our "airships" no more. toxic laced cavier(not mentioned on the can of course). Wad makes smoking that different? This is obviously an extravagant publicity stunt by Smint mints to try to publicize their mints' ability to knock out Smoker's Breath. Clever, Smint, but not clever enough. 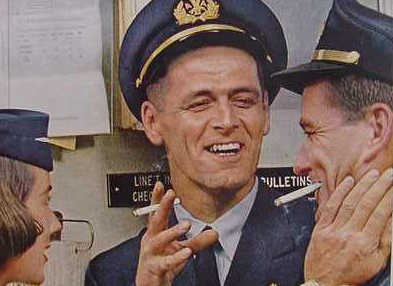 I would totally fly SMINTAIR to get away from people who call cigarettes "cancer sticks," and who look down at me because I am a helpless victim of Big Tobacco's ruthless ad campaigns. And because I am optimistic about the possibility of once-again hot stewardesses, er, flight attendants. Now THAT'S luxury, and I hope the brilliant minds behinnd SMINTAIR have taken that into account. Have fun on Jet Blues with your soggy ala carte sandwiches, my friends. You callin bad grammar unamerican? F you, commie..
Why not? If people want to pay more to be able to smoke in the air, they have every right too, just as those of us who don't smoke have every right to pay for non-smoking flights. If it's not affecting me, I don't have a problem with it. Although djohn makes a nice point that it is quite possibly just an elaborate publicity stunt that everyone is falling for. You know why SMINTAIR is a good idea? So I don't have to be trapped in a metal box for several hours with Shab, who obviously hates me because I'm a smoker, and look so cool as I slowly inhale my eventual killer. Hell, I could die in a plane crash, and then I would have spent my final hours with Shab, who hates me for because, as a child, I had no positive role models and considered the Marlboro Man a father figure. He never lied to me, so I went to where the flavor is. I will probably die here, if I live through that next plane crash. In answer to the question would I pay more to smoke on board, the answer is a definate YES. With regard to Smintair, although I wish them every possible success, I do seriously wonder at the profitablilty of a 747 with no economy cabin. I assume they have some guranteed Japanese coroprate business ... if not I think they may well be in trouble. I would actually like to see an economy cabin introduced, possibly with higher fares and an 'old fashoned' economy service marketed as the smokers alternative to the far east. Only if you include cigars. These were the good ole days! i'm pretty sure i just had a small heart attack. i mean seriously, i'm salivating. that's kinda' obvious, you can't smoke in public places, if you want to kill yourself, do it alone! This actually is indeed Superior expertise having writing and lots of thanks to yahoo search engine decide up me on here. I loved studying your content and added to the guide marks. The strategies you used to put up was clearly understandable. My husband also appreciated after reading this post. Let me undergo for more earlier.